This post was in collaboration with Uncommon Goods. All opinions are my own. December is fast approaching and it is an extra busy month for us. Think holiday preparations plus two kids birthdays. In order to actually get everything done on my check list, I have to start in November. I started planning my kids party a few weeks ago, and bought them birthday gifts which are now wrapped up and waiting for their big day! Now, I am shopping for christmas gifts for my family. I don't know about you, but I buy almost all of my gifts online. 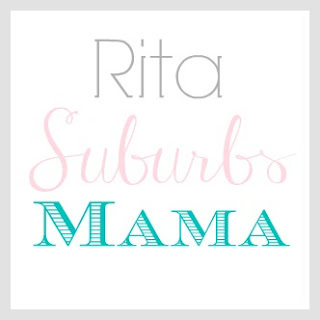 This way I can shop from the comfort of my couch, and find the best price on the things on my kids wishlist, and the most unique and special things for my husband and friends. When companies contact me to collaborate, I always check them out and ask myself if this is something I would buy, eat, or wear? If not, then I decline. When I went to check Uncommon Goods christmas gift ideas, I was amazed at all of their high quality and unique items. They have alot of handcrafted pieces, which are my favorite, I am a huge on sentimental gifts, I love to give and receive gifts that are special, unique and something I would treasure for a long time. Uncommon Goods is run out of Brooklyn NY, out of a historic army terminal. Not only are half of their items handmade here in the US, but one third of their entire collection features recycled/up cycled materials! Oh, and their lowest paid seasonal worker starts at 50% above the minimal wage. I don't know about you, but this sounds like an amazing company to support. 1. This stylish smartphone dock is handcrafted from driftwood gathered from the beaches of Maine. It is beautiful and functional, something I would love to see on my husbands nightstand. 2. This timeless maple wood watch is one of my top picks for my hubby, it is certainly a unique piece which will spark conversation. The watch maker also plants a new tree for every watch produced! 3. I love this beautifully crafted wooden domino set. Something we can play with the family and leave out as a decorative piece in the living room. 4. This beautiful chain has a unique love tuner on it. The chain has a small meditative flute, to be worn on a chain. This copper and brass pendant plays therapeutic tones with simple inhales and exhales through the mouth. Offering a stress-reducing sensation by focusing on your breath. 5. I know my husband would love this adventurer multi tool clip watch. It includes seven tools: a watch, bottle opener, knife, screwdriver, compass, tweezers, and a toothpick all in one design which can be attached to keys, bag or belt loop. 6. I am a sentimental person, and love saving our ticket stubs to look back at. With this ticket stub diary, you can save and organize your precious memories. 7. I love this mustache mug! It has 14 iconic mustaches from historic figures, Not sure which stache is which? A numbered answer key is printed on the bottom of the mug. the manly salves, scrubs and balms are specially made to meet the needs of the working man. From soothing sore feet, to healing cracked lips and knuckles. 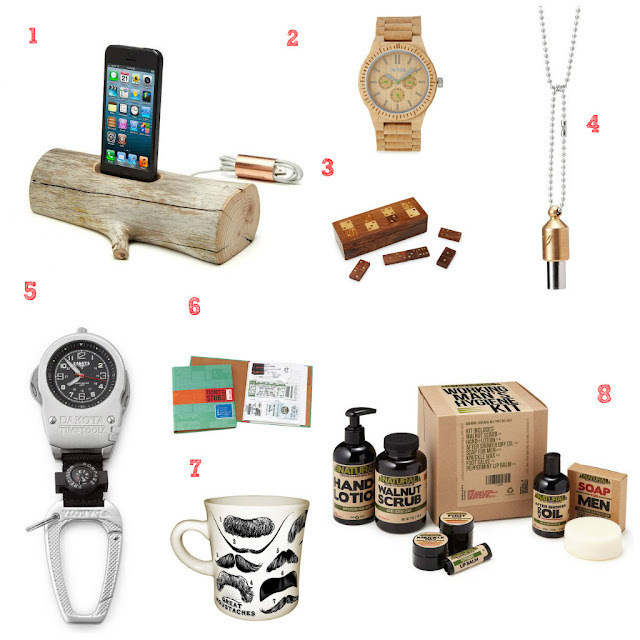 You can find more gift ideas for men here. 1. All three of my kids would love this wood rocker! The kids can all take turns rocking out! There is an app you can install on your smart phone, which you then attach to the guitar and play by strumming on the screen in 4 different modes. 2. The on the go art kit is too cute! it includes all the materials you need to complete eight projects based on the work of Vincent van Gogh, Georgia O'Keeffe, Henri Matisse, and other modern art masters. Perfect for road trips, plane trips or when we go out to eat. 3. This Goldilocks and three bears play set is adorable, I know that both my daughter and son would love it. It comes in a carrying case which would be perfect for travel! The kit includes a picture book and the house and furniture which fit easily together like a 3D puzzle, after they are finished, they just break it apart and put it back into the case, which can be stored on their bookshelf. 4. It's not a secret that my daughter loves to craft! This fairy kit is adorable. It has everything you need to make fairy houses, beds, necklaces, and off course the cute little fairies. 6. Another great shared gift for my kidos is this adorable ice cream truck! Perfect for playing indoors and out. 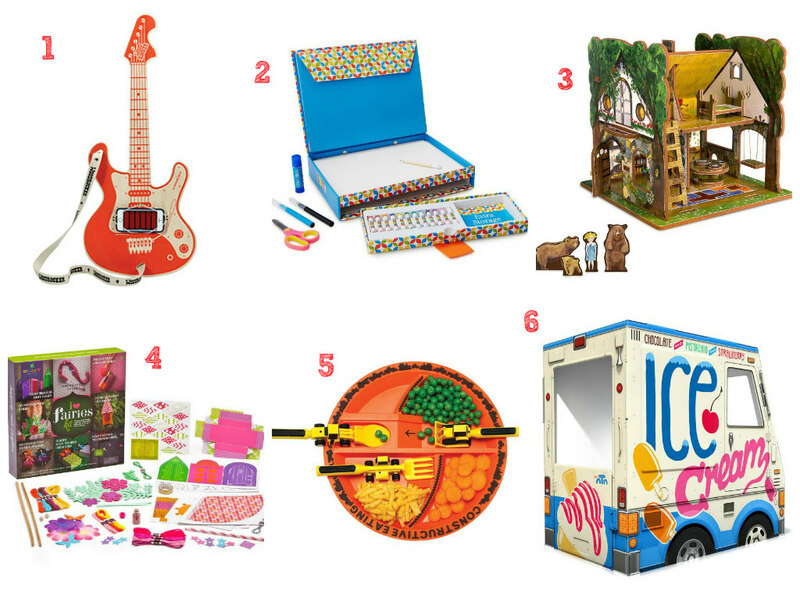 You can find more kids gift ideas here. 1. 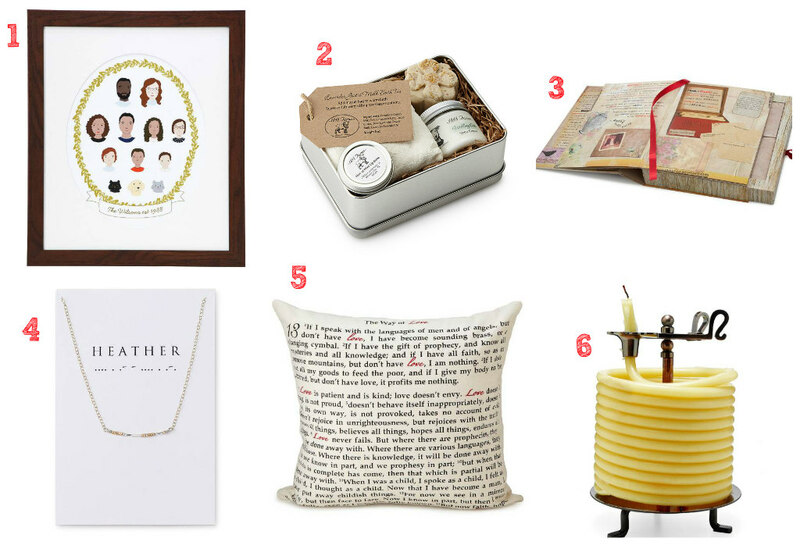 I adore the selection of personalized art that uncommon goods carries. This is family cameo portrait is one of my favorites, something I would treasure and pass down to my kids. 3. This mother & daughter letter book set has to be the greatest idea ever! The set includes 40 cards for mothers and daughters to complete and exchange. Once completed, the cards find their way back into the secret pockets of the book. Full with sentiment, each personalized book is meaningful way to honor your bond, and be passed down from generation to generation as an heirloom from the heart. They also have a grandparent & grandchild book. 4. I am a big fan of dainty jewelry. This custom morse code necklace is so beautiful! You can customize it with your name or a secret message like "i love you" or an anniversary date. 5. I love this Love pillow! It is printed with the well known love verses from 1 Corinthians. This is something that is beautiful, functional, and unique. 6. Ok, this 60 hour coiled candle is a show stopper! The 100% beeswax candle coil is fed in small increments through the candle clip. Once you run out, you can buy the refill. I have to say, I have never seen anything like it and would adore to get one for myself. You can find more gift ideas for ladies here. Do you recommend some concrete house toy for a boy? I think my 3 year old boy could enjoy plaing with.